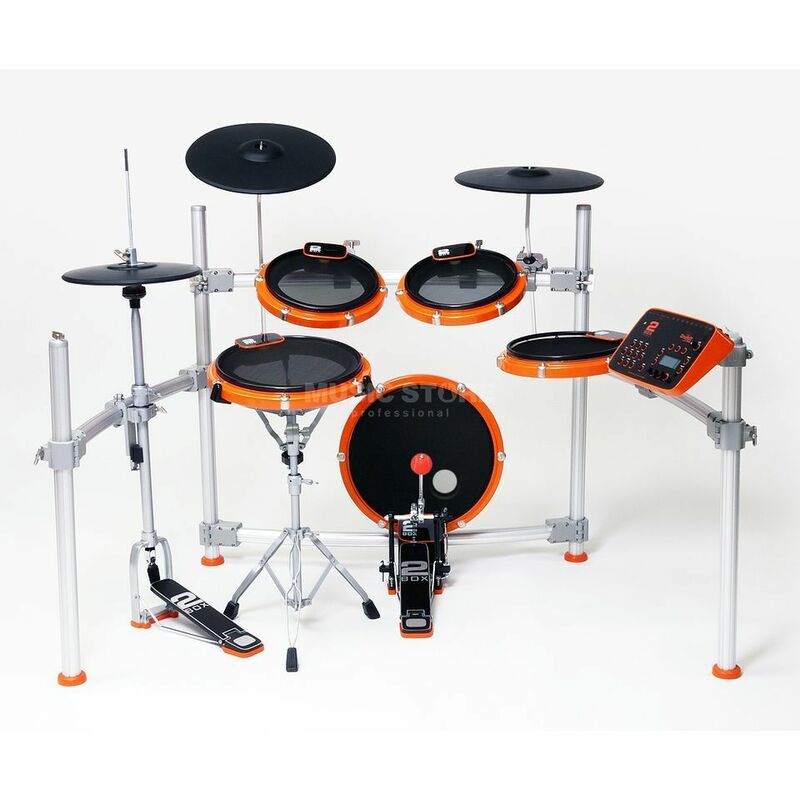 2BOX Electronic Drum Set "DrumIt 5"
Sweden has more to give than just Ikea and beautiful landscape. The latest export hit is 2Box: electronic drum systems that not just reanimate the unprecedented visually, but also send a clear message to competition with high quality technical equipment. DrumIt Five is an open sound drum system giving the user the freedom to choose which sounds to play and which heads to use. The system is built around a high strength, low weight pad / cymbal and stand system. Add to this an extremely powerful percussion module with a large on - board Flash memory, and you have the foundation for a truly ground breaking, new sensation in electronic drums. Equipped with 4GB of professionally recorded multi-layer samples in 24-bit technology, 100 rewritable memory locations, 10 dual-trigger inputs (via Split cables can be up to 15 (!) Pads connect), control software for organizing drum kits on the computer and much more, the module has its nickname called "The Brain" certainly deserved. The cymbal pads come with all the features that have become established and proven in the world of electronic drumming: Three trigger zones, which are free to prove; Choke function for stopping and a pioneering hi-hat system with magnet, so that the hi-hat can reflect adequately open, semi-open and closed sounds real faithfully. Coated all pools with silicone. The rebound is realistic and the stroke can be hardly heard through the material. The rack is made of ultra lightweight aluminum and gives the set a solid and secure base. All necessary brackets and holders are included with delivery. DDrum Clavia. Does it ring any bell? Well, the folks who made that groundbreaking drum for its time are the masterminds behind this kit. This kit has very good sounds, but the best part is that you can put sounds of your own in there. Imagine if you own a copy of BFD3, you can export the samples, via the provided PC software, to the module. You can cound with 4GB of flash memory (and there are ways that you can extend that, without any voiding issues). The pads bounce a little but trigger like wonder. The cymbals are the best, they are all 3-zone (bell, bow, edge) and you have 10 trigger inputs to use. Assembling the kit may be hard, they have some weird screws and assembly joints to work around, but it stands rather firmly when fully mounted. I use the module only, but i am quite happy with it. I use it for live shows and demanding touring. never failed me.